The Norsk Buhund klubb was originated in 1939 and Toralf Raanaas was the first president of this club that dealt with the Buhund breed of dogs. The Norwegian Buhund is a Spitz type dog of medium size. The nose is the same length as the skull with a well defined stop. The nose is black. The oval shaped eyes are dark with black eye outline. The prick, medium sized ears are erect and are very mobile. The tail is tightly curled over the back. The coat comes in wheaten or biscuit, ranging from light to yellowish red, black, and wolf-sable. The outer coat is smooth and harsh, while the undercoat is soft and woolly. The feet are small, oval shaped, and webbed. 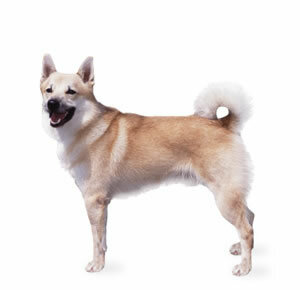 The Norwegian Buhund is cautious, cheerful, alert, and strong, intelligent and attentive. Very affectionate, they love giving kisses and hug. They need physical and mental stimulation and require consistent, firm leadership as they can be headstrong if they sense their handlers are not as strong minded as themselves. This breed of dogs likes to be taught and learn very quickly. A natural watch dog, it is brave and vocal but not aggressive. It is unlikely to bite or snap. The Norwegian Buhund is best to live in a house, small yard would be fine. They are very active and should get plenty of chances to exercise.they also can live in apartments there is plenty of space for this breed to roaming around. The coat should be brushed regularly and needs extra care during shedding season. This breed is a seasonal heavy shedder.This is a very active dog breed that needs to be exercised every day, with a long, brisk walk or jog. When going on walks this breed should be trained to obey his master. This Norwegian breed of dogs is usually a healthy dog breed with few medical and health problems, it is however prone to hip dysplasia and inherited eye problems, Other than these issues this breed does not suffer from any dog diseases. The lifespan of the Norwegian Buhund is generally between 13-15 years.